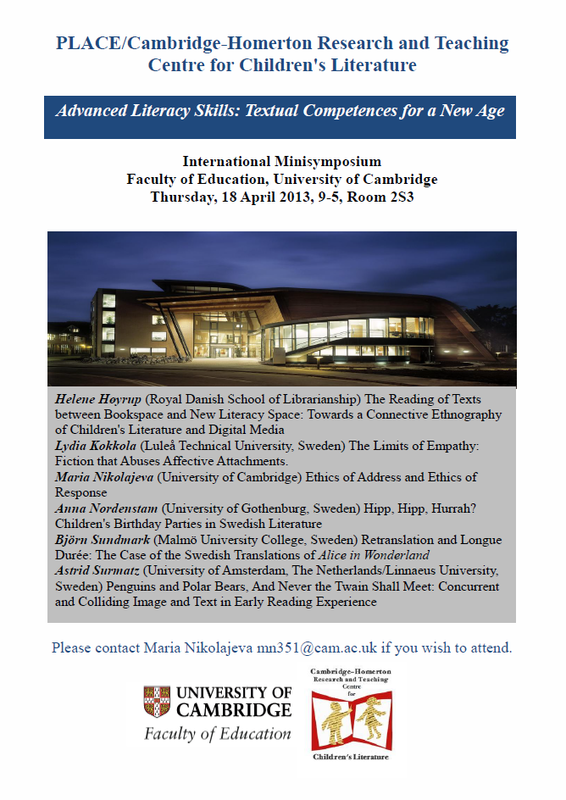 About a month ago I attended an international mini-symposium here, at the University of Cambridge, which brought together Children’s Literature scholars from across the UK, Sweden, Denmark, the Netherlands and the USA. The symposium was held in the interests of forming an international network of academics working in the field of Children’s Literature. This network of junior and senior academics would act as a forum within which to share ideas and discuss concerns. Members would be able to offer each other professional advice and work together to raise the profile of Children's Literature scholarship through summer schools, workshops, joint conference participation and electronic meetings. As you can imagine I was very excited about taking part in such a venture and the presentations and debates held during the symposium only served to fuel my enthusiasm. Talking to other PhD students at conferences and events I realise how privileged I am to be studying at an institution where there are so many other postgraduates researching Children's Literature. They form a dynamic group of scholars with which to share experiences, ask for advice and bounce ideas off. However, scanning through conference themes, blogs, tweets and self-published material I am also increasingly aware of how much research is out there in the wider world that hasn’t quite made it into refereed journals…yet! Therefore any organisation which can further communication between institutions and countries is, in my understanding, an invaluable asset to the whole community. 1) Do we need new ways of thinking about literacy with the advent of new technologies? The question was deliberately posed to be able to think about new technologies in the very widest sense: from the Internet and android phones to the latest brain scanning and tracking devices used in neuroscience. It proved to be a particularly significant stimulus for discussion in the light of earlier presentations by Helene Høyrup (Royal Danish School of Librarianship, Denmark) on how new digital spaces can be viewed from the perspective of more traditional literary forms and by Lydia Kokkola and Maria Nikolajeva (University of Cambridge, UK) on how recent advances in Theory of Mind can be applied to Children’s Literature. a) Do we need to change the way we teach children how to read in the light of these new literacies? b) Should we be worried about the intrusiveness of these new technologies? c) Should we be worried about the commercialisation of these new literacies? Thinking through these point I became increasingly aware that I do not know enough about these new literacies. Despite having a deep-seated belief that certain key skills, such as critical reading and response, logical reasoning and argument, creative engagement and production, are common to all literacies, I do not know enough about these new literacies to be able to assess their opportunities and restrictions; for example, to what extent do they encourage or dissuade readers forms reading critically or responding creatively? Fortunately I don't seem to be the only person who is uncertain. In his recently published book, What You Really Need to Know about the Internet: From Gutenberg to Zuckerberg (2012), researcher and journalist John Naughton (University of Cambridge) compares the invention of the internet to that of the printing press and reminds us that the future is ultimately unknowable because while it is fairly easy to predict the short term impact of this new technology, it is much harder to predict the long-term effects. The invention of movable type reshaped not only our society but also our selves; will the internet do the same? I’ve yet to mull over the full implications of his statements (and finish reading the book). However, what I find fascinating is this idea that the Internet allows for growing complexity and opportunity which we cannot control and regulate using old methods. Instead I think that we need to change with it and adapt the ways in which we read, teach and research Children’s Literature to suit this new environment. Authors and illustrators are already moving with the times and producing some exceptional picturebooks and novels that engage with the growing complexity of the twenty-first century world our children are growing up in. Can we do the same? 2) Do we need new ways of working, teaching and researching Children’s Literature in academic institutions? I would like to suggest that the Advanced Literary Skills Project might be one such way.